May 26, 1990, L. G. Crabo. 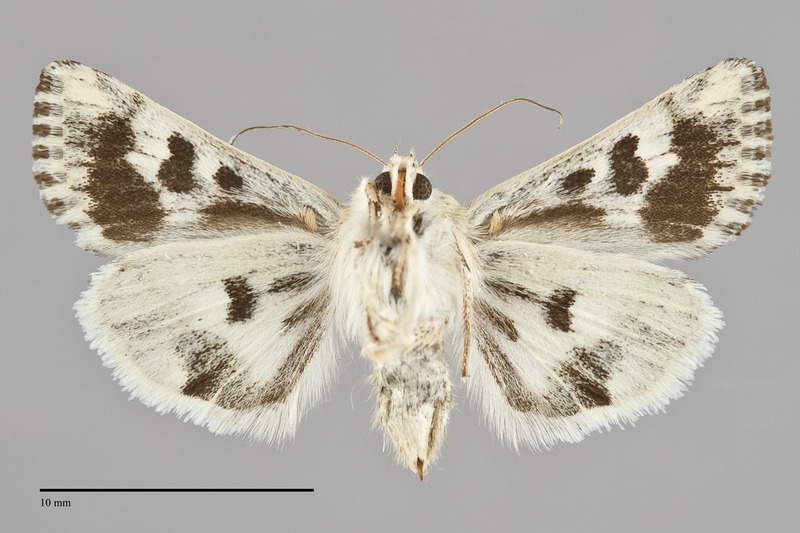 Schinia meadi is a small (FW length 10 - 13 mm) mottled light olive-green and cream moth with shiny silver white antemedial and postmedial lines and a black and white hindwing that flies over sandy soils in steppes during spring and early summer. 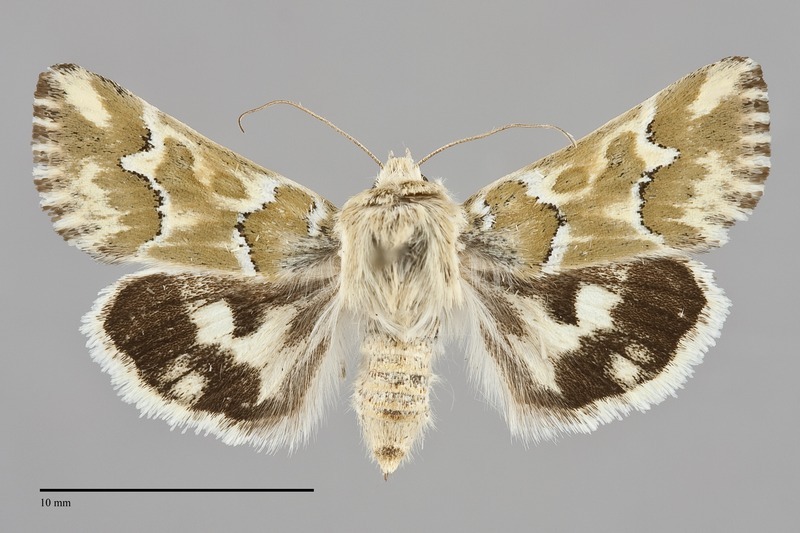 The median and terminal areas of the forewing are mostly yellowish cream colored, with light to dark olive-green mottling along the costa and on the posterior wing in the median area and opposite the cell in the terminal area. The base medial to the antemedial line and the subterminal area are solidly of the same olive-green, as are the orbicular and reniform spots. The basal, antemedial, and postmedial lines are powdery black, double but incomplete, filled with silvery white. The basal line is short and located near the base. The antemedial line is slightly irregular, strongly excurved toward the outer margin but drawn focally toward the base below the costa. The postmedial line is biconcave: the anterior segment between the costa and vein M2 and the lower half are both strongly concave toward the base. As a result, the line is oblique toward the outer margin at the wing margins and forms an acute point toward the outer margin at the level of the lower reniform spot. The subterminal line is only evident as a jagged interface between the green subterminal area and the cream terminal area. The fringe is strongly checkered cream and dark green-gray. The orbicular spot is oval. The reniform spot is moderately large, weakly figure-eight-shaped, often with the posteromedial corner extended toward the wing base across the lower cell to fuse with the orbicular spot. The claviform spot is small, often a green smudge with a few black scales. The hindwing ground color is pale cream, suffused with gray between the base and the discal spot and along the inner margin. The discal spot is semilunar, black. The marginal band is wide with a well-defined irregular medial margin and pale spots near the outer margin on the mid-wing. The hindwing fringe is cream. The head and thorax are light gray-olive. The male antenna is filiform. This species is easily recognizable by its light yellow and green forewing with silver lines and unusual biconcave postmedial line shape. It cannot be confused with other species in our area. This species is very common and widely distributed on the dry short-grass prairies of the Great Plains, but may also be common in dry sand dunes habitats. In the Pacific Northwest, it is more sporadic on dry grasslands at low elevations east of the Cascades. It is locally abundant on dunes in the Columbia Basin. Schinia meadi is found in the Columbia Basin and southern Idaho in our region. A record from northwestern Washington is most likely mislabelled. This species is widely distributed in the West. It is found from central Alberta and northern Minnesota to the Texas Panhandle on the Great Plains. The range includes the Great Basin to eastern California. No information is presently available regarding larval foodplants of this species. The most likely foodplant is Psoralea spp. (Fabaceae) based on habitat association in Washington. Adults are predominantly nocturnal but are often seen flying in thick stands of Psoralea during the day. They are attracted to lights. The flight period is late spring and summer. The moth has been collected from May to August in the Northwest.